Migas (pronounced MEE gahs) is a Tex-Mex tangle of eggs, bits of corn tortilla, and a host of savory ingredients, from black beans, chorizo and cheese to salsa, avocado and chiles. A dish that many professed egg-haters relish, it probably can thank its existence to thrifty cooks looking to use left-over tortillas, since tortillas are an integral part of the dish. The word, migas, in fact, is derived from the Spanish word for crumbs. 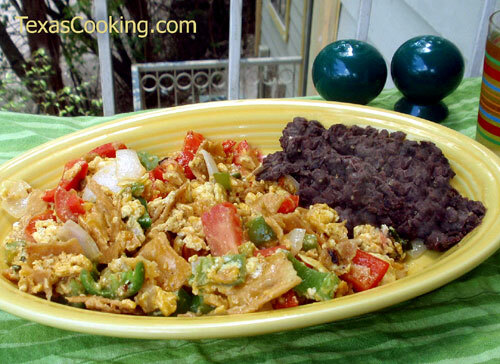 This recipe appeared in a larger breakfast article about migas. In a small bowl, lightly beat together the eggs, water and salsa, and set aside. Warm the butter and olive oil in a heavy skillet. Add the tortilla pieces and sauté until softened. Add the chopped onion and sauté until it is transparent. Stir in the chopped green chiles. Pour the egg mixture into the skillet, and "scramble" until eggs are done. Remove the skillet from heat, and sprinkle the chopped tomato, avocado, cilantro and cheese into the eggs, again stirring well. Serve at once with warm flour tortillas. Garnish with additional salsa and crema or sour cream. Note: This recipe makes two servings, but it can easily be doubled or tripled or more for a larger crowd. Migas are a terrific brunch dish. Chop the onion, green chiles, tomato, avocado and cilantro before you start the migas so they'll be ready when you need them. Want to make your own tortillas? See How to Make Corn Tortillas and How to Make Flour Tortillas.